Reuters: UTTIPEC is moving in the right direction to address the issues related to traffic and transportation infrastructure in New Delhi. It’s no secret that Indian cities face infrastructure challenges. Problems are often exacerbated by the lack of coordination among local government agencies, who anyway need to take a much more prominent role in urban planning. An agency within the Delhi Development Authority is moving in the right direction. The Unified Traffic and Transportation Infrastructure (Planning and Engineering) Center, thankfully known more simply as UTTIPEC, was established in 2008 under a special provision of the Delhi Development Act. It is responsible for planning oversight of all traffic and transportation infrastructure in the capital. In keeping with the National Urban Transport Policy, UTTIPEC aims to make sure that pedestrians, cyclists and public transport are given at least as much importance as private vehicles. UTTIPEC may be the only agency of its kind in India, where planning and implementation of traffic and transportation projects are coordinated by a single agency. Working groups for specific projects are supposed to meet once a week, and a governing body meets once a month to approve projects, or not. In essence, UTTIPEC is a planning agency that forces cooperation and collaboration among various departments representing different interests. WSJ: DDA has been around for many years now. What prompted the creation of UTTIPEC? Mr. Bhattacharjee: It was a series of events. First, a technical committee within DDA had been responsible for approving flyovers and other road projects, but it was a narrow scope. Second, the last couple of iterations of the Delhi Master Plan had been talking about creating a Unified Metropolitan Transport Authority that would adopt a holistic approach toward reviewing transport improvements, but was unsuccessful. Since the transport scenario is complex with various disciplines and players involved, there was an urgent need for planning, integration and inter-agency coordination. UTTIPEC was formed through a Central Government Notification to fulfill that role. WSJ: There are so many construction projects happening around the city at any given time. How do these projects come under the reviewing authority of Uttipec? Mr. Bhattacharjee: This is still a work in progress. The Public Works Department controls the major roads within the city, and it decides how these should be reviewed and if Uttipec should be involved. Then there are a number of projects submitted to the technical committee for review. This is not how the process should be. For example, UTTIPEC’s first approval was a set of pedestrian design guidelines, because Uttipec realized that pedestrians were being treated as secondary in Delhi, and this needed to change. Now all new and retrofit street projects need to follow these guidelines and are subject to review by UTTIPEC. WSJ: What have been some of Uttpec’s biggest accomplishments? Mr. Bhattacharjee: The creation of Uttipec itself was a great achievement because of the need for coordination between the agencies and a comprehensive review of all aspects of a project. This has been possible because the governing body is headed by the Lieutenant Governor [Tejendra Khanna]. With UTTIPEC , he started coming to the DDA offices every month to chair meetings, and it forced the heads of all the other departments of the Delhi government and other important stakeholders to be involved. Until then, junior engineers were involved in meetings without the authority to make decisions. Now, the presence of all these high-level decision-makers in the room allows for coordination at a much higher-level and decisions to be made relatively quicker. We also have 10 working groups now working on a range of issues from developing planning guidelines to road capacity building, community outreach and even the monitoring of construction projects. In terms of actual projects, there are about 20-25 projects that have been approved so far, including the ITO Urban Renewal Project, and Vikas Marg Metro Connectivity, which includes a parking strategy. But really, the biggest accomplishment has been getting all the different departments to meet, brainstorm and arrive at a consensus. WSJ: What have the challenges been and how have you overcome them? Mr. Bhattacharjee: Initially, people were very uncomfortable with this level of transparency. People were also used to a certain way of working and were not open to deliberations or change in the process. Planning was totally ignored by the engineers… Now the engineers have all come around, they even consult UTTIPEC before they hire their own consultants to make sure that they meet Uttipec’s requirements. WSJ: Is it possible that Uttipec’s powers could be too far-reaching? Are there checks and balances in place to make sure that the vision of a wider audience is served? What is the process for approval? Mr. Bhattacharjee: The process is no different than what was happening when DDA’s technical committee approved projects. In fact, there is better coordination now and all agencies can weigh in. What we have done is put some guidelines in place that we then use to approve projects. Sometimes, there are projects that come in and we realize that we need to develop guidelines. The process for approval is pretty clear cut. Working groups discuss and deliberate, and the governing body (which includes representatives from all departments) approves it or asks the working group to revise it. Projects go through a public review process and are posted on UTTIPEC ’s website for comment. WSJ: The Ministry of Urban Development is getting ready to launch the second phase of its Jawaharlal Nehru National Urban Renewal Mission program over the next couple of months. The program is supposed to provide an estimated $40 billion for urban infrastructure improvements across the country. Do you have any advice for local governments that may want to emulate Uttipec’s institutional framework and operational procedures? Mr. Bhattacharjee: Yes, this is the right time to create an agency like Uttipec so that all the departments can sit together and comprehensively prioritize the entire city’s interests, not indulge in piecemeal, short-term improvements like the flyovers that are being built across mid-level cities around India. The idea should be develop in a way that is more “planning-focused” and less focused on getting the maximum construction funds possible. There are four stages for any project- planning, implementation (enforcement during construction), management, and operation and maintenance. During the planning stage, people from the other three stages should be involved. Only then will all departments take ownership of projects, and that is what an agency like UTTIPEC will help achieve. Raka Choudhury is an urban planner with a decade’s experience in Washington, DC. Since her return to Asia, she has worked on projects in Singapore, Malaysia and India. The views expressed here are her own. NEW DELHI: The Union and the city governments along with the Delhi Metro Rail Corporation have been asked by the Supreme Court to respond to a plea seeking provision of drinking water and toilet facilities at Metro stations. A bench of justices Deepak Verma and Ibrahim Kalifullah issued notices to the respondent on a petition by one Satish Kumar Sharma, an advocate through his counsel Atulesh Kumar against a Delhi High Court order which had dismissed the plea. While issuing the notices recently, the apex %court said the matter be tagged %with another petition filed %by an NGO which too %has complained of lack of various basic amenities in the metro service, a popular mode of transport in the NCR region. The petitioner submitted that since water and toilets are available at all airports and railway stations, those travelling by Metro cannot be deprived of similar facilities. On a day Delhiites reeled under waterlogging woes due to heavy rains, the Delhi High Court today pulled up the civic agencies for not taking measures to desilt drains to prevent inconvenience to people during monsoon in the national capital. The court also asked trifurcated MCD and NDMC to place on record the road maps relating to drainage system by next week. "Drains have to be cleaned. There are no short-term measures to stop waterlogging in the city. If you don't know the number of drains in the area, how will you clean them?," a division bench of justices S K Kaul and Vipin Sanghi asked after MCD failed to file the status report. The civic body claimed that long-term plans were there as per the Masterplan 2021 to solve the problem. "Year after year the problem of waterlogging occurs. You cannot ask citizens to wait for implementation of your long- term plans," the bench said and asked the authorities to bring the records of road maps to court by August 28. The bench made the observations while hearing a plea by NGO Nyaya Bhoomi President B B Sharan to launch contempt proceedings against the civic body officials for their alleged failure in complying with the court's July 11 order. The high court had on July 11 had directed officials to take steps to end the problem of waterlogging in the capital in 15 days. The court's directions had come while hearing two PILs, filed by the NGO and Gaurav Bansal, a lawyer, seeking steps to address the problem of waterlogging in the capital. One of the petitions had claimed MCD and Public Works Department (PWD) have done nothing significant after 1998 to properly desilt drains and this was causing waterlogging on major roads even after the slightest of rain. Giving a list of 41 waterlogging-prone areas here, the petition referred to a response received under an RTI, and said affected areas included Ashram Chowk, South Extension Part-I, Mathura Road, ISBT Kashmere Gate, RTR Marg near Moti Bagh flyover, Siri Fort Road, Dhaula Kuan underpass and underpasses around Dwarka. New Delhi: A recent government report has concluded that congestion in urban areas has risen, thanks to the disproportionate increase in road length and vehicular growth. Road length has increased by 3.3% in the past decade, but vehicles have risen by 10%. The latest Basic Road Statistics Report — prepared by the transport research wing of the highways ministry — says this mismatch “has resulted in the saturation of road capacities on many stretches.” The report cites while 59% of India’s total road length is rural roads, urban roads account for only 9%. According to the report, the growth of cars, jeeps and taxis in the past decade has surpassed two-wheelers. 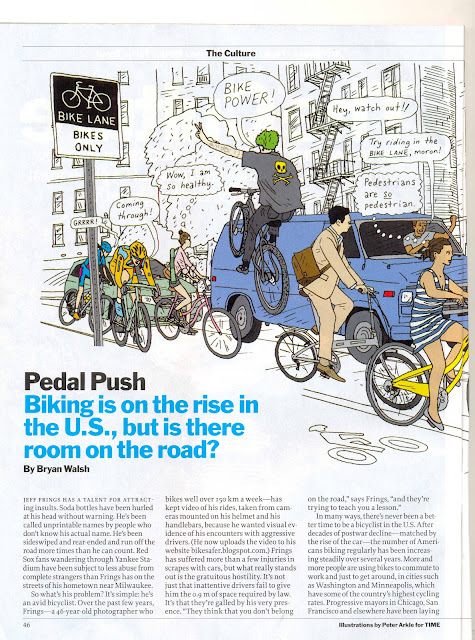 During 2001-2011, annual car growth was 10.5% against 9.1% of two-wheelers. Urban experts say the concentration of vehicles in urban areas and particularly cars is one of the major reasons behind traffic jams. “About 80% vehicles ply on urban roads. 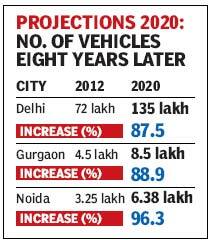 Besides, more people are buying cars since their prices have seen little increase along with the rise in disposable income and easier auto financing schemes,” said Yash Sachdev, an urban transport expert. The report put the total road length in India at 47 lakh km (as on March, 2011) against 40 lakh in 2007. Of this, about 54% is paved and much lower as compared to Japan, Korea, the UK and the USA. The ministry’s data claims over 90% of the roads in all categories are “motorable”. The major push in increase in road length has been due to construction of rural roads. Between 2007 and 2011 the road network increased by 6.74 lakh km and the largest increase was in the length of rural roads at 3.56 lakh km. Nevertheless, there was substantial increase in the urban road category at 1.11 lakh km, whereas there was incremental rise in NHs, state highways and project roads at 4,344 km, 11,663 km and 20,034km, respectively. The report puts country’s expressways/motorways length around 227 km. Get ready to pay more for parking your car in authorised parking lots in the city. Lieutenant Governor Tejendra Khanna (L-G) on Thursday gave in-principle approval to increase parking charges substantially. Sources said the L-G asked all stakeholders to formulate a proper policy to check the number of private vehicles, which are growing at a steady pace. According to the new proposal, motorists will have to pay R30 for the first hour and R40 each for every subsequent hour to park vehicles. Sources said the agencies concerned had been asked to send their final suggestions. Once they all give their approval in writing, the charges would be increased. In a high-level meeting attended by Delhi chief secretary PK Tripathi, transport secretary R Chandramohan, heads of the four municipal bodies, EPCA chairman Bhure Lal, traffic chief Satyendra Garg, Khanna said the parking issue should be streamlined and asked agencies to draw a consensus. The agencies also proposed to make it mandatory for people to declare parking space while buying a new car. Officials said countries such as Japan have made it mandatory for car buyers to declare parking space. Delhiites prefer their cars to public transport. 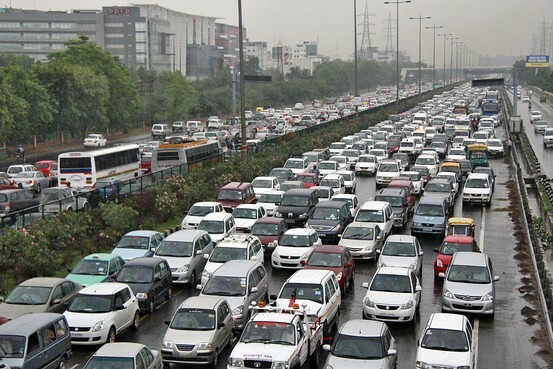 With 2.1million cars registered till March 2011, Delhi has the highest car population in the country, according to a latest report of the road transport ministry. Next in line are Bangalore (710,852) and Chennai (598,708). Surprisingly, Mumbai — the financial capital of the country— only has 562,526 registered cars. That public transport is not a priority can be gauged from the fact that as compared to cars, the number of buses registered in Delhi till 2011 was a mere 45,000. At 7.2 million, Delhi's vehicle population exceeds the combined vehicle population of Chennai (3.4 million), Kolkata (444,718), Lucknow (1.2 million) and Mumbai (1.8 million). “At this rate the number of car would double by 2020. How much more road can you build in the city? ... The Centre needs to aggressively scale up public transport and discourage usage of cars during peak hours,” said Anumita Roychoudhury, executive director, Centre for Science and Environment. The government's emphasis to promote public transport does not seem to have cut much ice. Of the 142 million motor vehicles registered in India till March 2011, the share of two-wheelers, cars, jeeps and taxis was 121 million and the share of buses was just 1.6 million. Between 2001 and 2011, while the increase in the number of cars and two-wheelers has been over 50%, the share of buses in the overall vehicles registered has gone down to 1.1% in 2011 from 1.2%, in 2001. Among the states, Maharashtra (17.4 million) accounted for the largest share of the total registered motor vehicles in India followed by Tamil Nadu, UP, Gujarat and Andhra Pradesh. Another worrying trend, according to the report, is the mismatch between the rise in the number of motor vehicles and the growth rate of road network. Between 2001 and 2011, the growth rate of registered motor vehicles was almost three times the growth rate of the road network. Dinesh Mohan and Geetam Tiwari, who came out in defence of the corridor and called the Central Road Research Institute (CRRI) study biased. Mohan and Tiwari were on board when the Delhi government had planned, designed and executed the BRT corridor between Ambedkar Nagar and Moolchand Hospital. 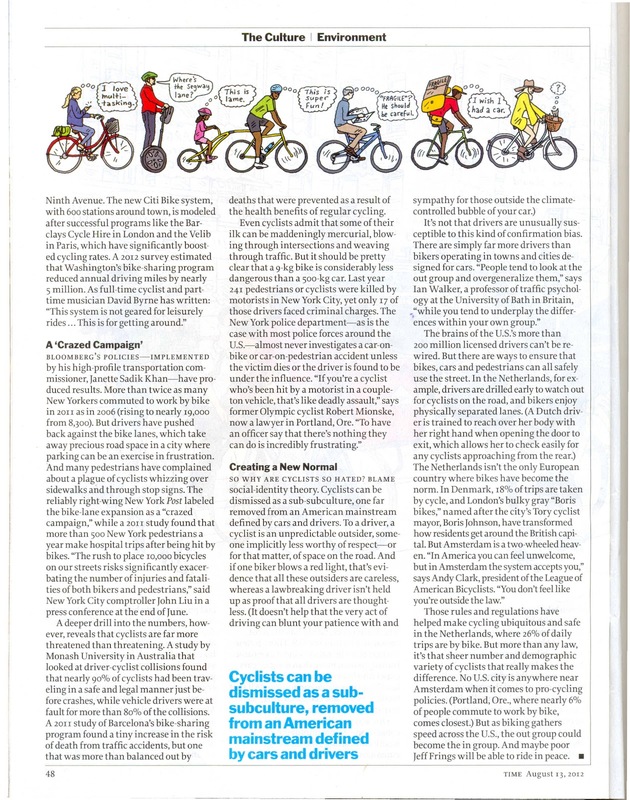 "The CRRI study did not take the views of bus users. The survey took views of 25% bus users, even though 66% people travelling on the corridor are actually bus users," said Tiwari. Hearing a public interest litigation, the Delhi High Court had asked the CRRI to carry out a study on the BRT corridor in May this year. Mohan said he was surprised to see that the CRRI, which had not been allowed to work on the BRT corridor by the ministry of urban development because it was not "competent enough to work on a public transport project," was asked by the high court to review the project. "Data shows that the existing BRT corridor is one of the safest roads for women, children and elderly people in Delhi. Only two accidents took place on the 5.8-km BRT stretch in 2010. Also, a large number of people living in the neighbouring areas come for a walk here," Mohan said. Trashing the report submitted by the CRRI to the High Court, the NGO claimed that the report was skewed and only highlighted the views and suggestions of car users. NGO director Dunu Roy said a parallel survey conducted by them clearly showed that almost 90% people who travelled on the corridor were happy with separate lane for buses and emergency vehicles. 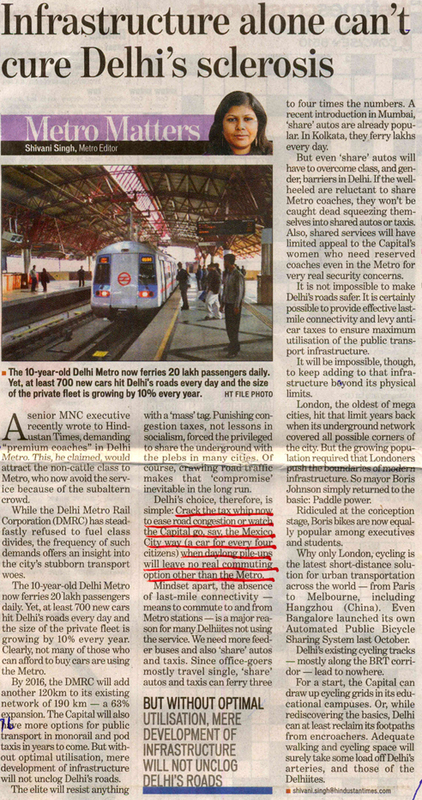 Tiwari said Delhi government should have actually extended the corridor further so more people could benefit from it. The NCR is crumbling under the pressure of vehicles. And multi-level parkings cannot be the only way out of this parking mess. The solution lies in ensuring that parking lots are built within deadlines, ensuring the existing ones operate smoothly, converting illegal parkings into legal ones and promoting public transport. Sample this: Less than a month after its inauguration, cars were stuck in the Rs. 80 crore Sarojini Nagar automatic multi-level parking for two hours due to a technical snag. The Haryana Urban Development Authority’s (HUDA) proposal to construct four multi-level parkings has not materialised while the Municipal Corporation of Gurgaon’s (MCG) plan to build a multi-level lot in old Gurgaon is stuck in red tape. The Sarojini Nagar parking project, experts say, was carried out without a clear strategy. “Commuters still prefer to park their vehicles in surface parkings,” said Anumita Roy Chowdhary, from Centre for Science and Environment (CSE). The new multi-level parking on BKS Marg too is used below its capacity. The CSE, in a study, found that multi-level parkings are operating at a mere 20 to 40% of their capacity. On the other hand, the NDMC and the three municipal corporations are dragging their feet on the construction of 15 new parking projects, that are supposed to make space for nearly 5,000. In Noida, authorities are planning to tackle the situation by building more multi-level parkings — two will be built in Sector 18, another will come up at Sector 38A at the Botanical Garden Metro station. Together, they will be able to accommodate 8,000 vehicles. The deadline: Next 18 months. 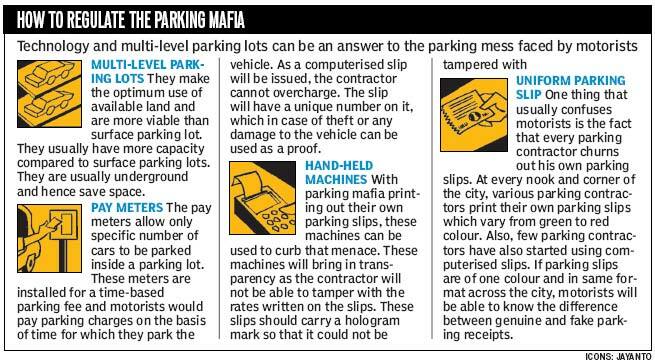 What also remains to be done is putting an end to the parking mafia, which the Noida police say they will do by equipping parking attendants hand-held devices to issue parking slips. The contractors will be asked to get the police verification of attendants done. Noida Authority is planning to make contractors liable for cars stolen from their parking lot by making them submit Rs. 5 lakh as compensation if a car is stolen from their parking lot. NEW DELHI: All corridor improvement plans have to address government policies of equitable distribution of road space for all kinds of road users - and has to focus on movement of maximum number of people, not vehicles. With this mandate, the state government , PWD and planning body UTTIPEC are working out the terms of reference for 10 future projects that have been proposed by PWD. These include the corridor improvement of Mathura Road from Ashram Chowk to Modi Mill flyover, elevated road on new Rohtak Road and Pankha Road, among others, said officials. In a meeting with PWD minister Raj Kumar Chauhan , principal secretary PWD and PWD engineer-in-chief and UTTIPEC director Ashok Bhattacharjee on Tuesday, the 10 projects proposed by PWD were discussed. "We wanted to consult UTTIPEC before the feasibility study of projects to iron out differences of opinion beforehand. By bringing UTTIPEC on board , we hope this will help reduce any delay ," said Chauhan. UTTIPEC has advised PWD to consider areas in totality , and different urban development projects in relation to each other. For instance , some of the projects are planned for areas near Metro phase-3 influence zones . "Instead of focusing on single-point interventions like a flyover or focusing on small areas, we will ask consultants to take entire corridor into consideration. The plan for corridor improvement of Mathura Road from Ashram chowk to DND flyover has been extended to Modi Mill flyover as suggested by UTTIPEC," Chauhan said. Similarly, proposal for an elevated road on new Rohtak Road will contain the feasibility study till Liberty cinema, said officials. For Peeragarhi chowk, the feasibility plan will take into area extended on either side. The corridor improvement plan for Najafgarh road and Pankha road have been clubbed as well. The Hindu: This photo taken on October 20, 2008 shows a picture of Bogota's Bus Rapid Transit System used during the presentation by Vijayawada Municipal Corporation officials. Frequent gridlock, unbridled congestion and health hazards due to carbon dioxide emission are part of the urban nightmare. Spiralling fuel costs and limited space further add to the woes of Indian cities. It is slowly dawning on policymakers that improved public transport is the key to sorting out these problems. But the question they frequently ask is whether people would make the shift to public transport. A host of cities from Africa to Australia, led by Curitiba and Bogota, have convincingly demonstrated that a smart Bus Rapid Transit System (BRTS) can make a difference. The first BRTS, inaugurated in 1974 in Curitiba, Brazil, caught the world’s attention. The city managers boldly demarcated dedicated bus lanes on roads perceived as a privileged space for cars. These exclusive lanes improved speed and reduced travel time. Well-designed buses turned intra-city travel a pleasure. Intelligent integration of bus network and city planning reduced trip lengths. In 2000, the city of Bogotá in Colombia improved upon the Curitiba model and launched its own TransMilenio BRTS. Its resounding success silenced the sceptics and reiterated that wise planning does deliver. Cities were enlightened, and more and more of them reinvented their bus transport system. Indian cities, where the usage of private cars still constitutes a small percentage, had a well-working bus transport in the past. But over the years, they overlooked modernisation and failed to make sufficient investments. Consequently, the quality of services deteriorated. Cities such as Chennai that need a fleet of about 8,000 buses run on half the strength. Delhi, which should have about 11,000 buses, has only 5,771. As a result, India offers a meagre 1.29 buses per thousand passengers, while other well-planned countries provide vastly more — Brazil has 10.3 buses per thousand. The gaping holes in Indian urban transport policy stand exposed. Seemingly, the government learnt its lessons, and re-thought its approach. It announced a new National Urban Transport Policy in 2006, under which cities must prioritise public transport and take measures to make it more attractive. 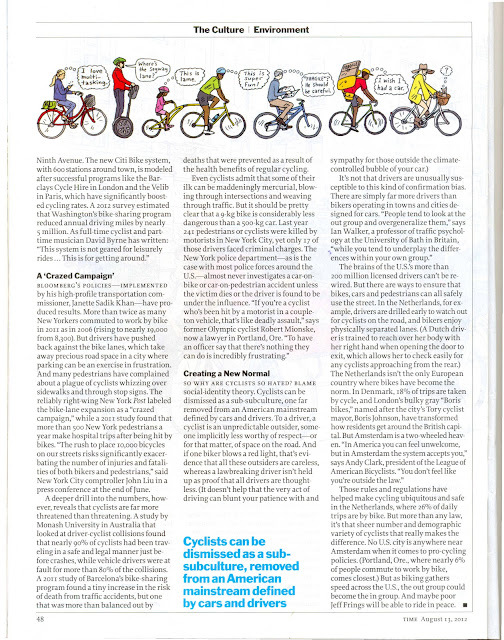 It strongly recommended that lanes and corridors be reserved for public transport and non-motorised modes of travel. The working group on urban transport for the Twelfth Plan has also recommended an investment of more than Rs. 40,000 crore to augment bus transport over the next five years. It is in this context that cities such as Delhi and Ahmedabad chose to implement the BRTS. A recent audit of the BRTS across the world by the Institute for Transportation and Development Policy (ITDP) showed that Ahmedabad scored 76 out of 100 points, while Delhi scored only 22 points. The best system in the world — Bogota’s TransMilenio — topped the list with 93 points. This is not a reflection on the usage of Delhi BRTS, but on the dilution of design parameters. Despite having only a truncated network, the Delhi system carries about 12,000 passengers an hour per direction — far more than cities such as Beijing. The lower and middle-income groups, starved of good transport facilities, found the BRTS a great service. But the minority car owners strongly felt that the road space belonged to them and tried to put a spoke in the city’s wheels. On the other hand, Ahmedabad’s BRTS, aptly named Janmarg — people’s path — made significant design improvements, developed a large network, provided comfortable stations and safe transfers. Undiluted public support helped it succeed, where Delhi failed. The contrast in the tale of two cities — Delhi and Ahmedabad — shows that half-hearted measures to address critical urban issues will not deliver. The HinduThis April 20, 2008 photo shows a scene at the Chirag Dilli crossing during the first trial run of the Bus Rapid Transit corridor in New Delhi. After the success of the Delhi Metro Rail Project, the Delhi government asked IIT-Delhi and RITES in 2004 to design and implement the first Bus Rapid Transit (BRT) corridor in Delhi along a 5.8-km stretch from Ambedkar Nagar to Mool Chand. From the day it opened in 2008, though, it has faced protests, particularly from private vehicle users, because their travel time increased. Some media groups launched campaigns against the system, and with politicians joining the chorus, the government put on hold 14 similar projects. Based on the CRRI report, the court directed in mid-July that all categories of vehicles be allowed to ply on the dedicated bus lanes. The government vowed to move the Supreme Court against the order, with which it did not comply. It has been issued a contempt notice, and has to reply by August 8. Government counsel K.T.S. Tulsi says: “The CRRI report is full of contradictions. In fact, it supports the continuation of BRT with its conclusion that 70 per cent of its users were moving faster and there was a 32 per cent increase in bus ridership.” Car owners, he adds, are the major protesting group. Chief Minister Sheila Dikshit has said BRT is “for the common man,” but it faces hurdles from “vested interests.” A big question mark now hangs over the present project, while uncertainty persists on the continuation of the system as a whole. “The main advantage of BRT can be seen during rush hour as it gives preference to buses, which, on average, carry around 40 people, instead of cars or other private vehicles. 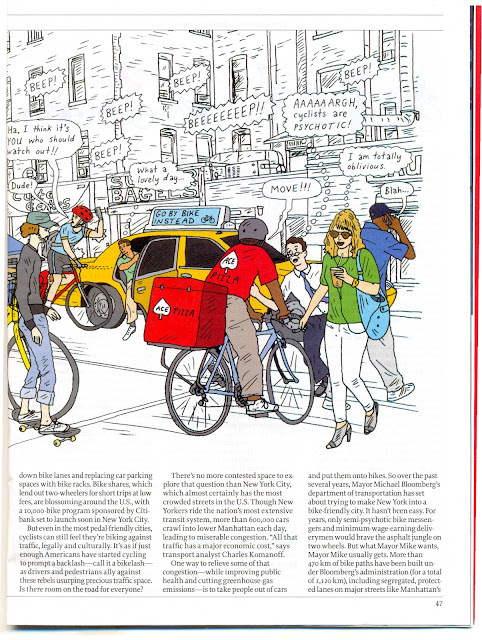 A bus occupies the space of just about two cars and carries about 10 times as many people,” Mr. Sahai explains. DIMTS officials point out that BRT is a low-cost option, compared to the Metro. One km of BRT costs Rs. 15-20 crore, about 20 times less than Metro which costs around Rs. 300-400 crore a km. 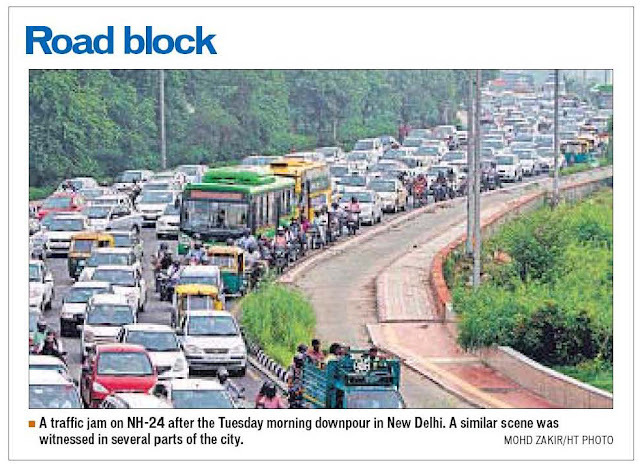 In Delhi, BRT carries around 12,400 passengers per hour per direction as against about 25,000 for Delhi Metro. But car owners see a vacant lane for buses and wonder why they cannot use it. There are other factors too. Planners earmarked a 4.5-metre space for pedestrians and cyclists, which is seen as underused, while providing motorised vehicle users 7.5 metres and bus lanes 3.3 metres on each carriageway. Learning from experience, DIMTS has proposed several modifications in six new BRT projects. “Fewer junctions to reduce stoppage and waiting time, grade separators to eliminate junctions and a special purpose vehicle to run dedicated buses at high frequency. The dug-up roads, innumerable barricades to facilitate the construction of flyovers and thinning of the main thoroughfares made commuters curse the Ahmedabad Municipal Corporation (AMC) under their breath. But some five years later, the same commuters are enjoying the comfortable ride on the Bus Rapid Transit System (BRTS), praising the foresight of the authorities. The project was visualised by the city and the transport authorities, with the help of the Centre for Environment Planning and Technology (CEPT) University, the key planner, to cover the entire city. It will create a viable public transport system in the absence of local trains operating in the metros. Of the first two phases of the 88.9-km route to cover some important and busy localities, less than 25 km, covering two routes, have become fully operational, while work is under way on the other routes, including the most congested roads that cut through the heart of the city to reach the main railway station. When the work started in 2007, the first two phases was estimated to cost Rs. 990 crore. But the first phase of 12.5 km itself, covering a part of the posh western parts of the city, consumed more than Rs. 400 crore. The authorities estimate that the overall cost could be more than double the original estimate. Yet, given the popular response to the BRTS, Ahmedabad Janmarg Limited (AJL), the special purpose vehicle created by the AMC for implementing the project under the Jawaharlal Nehru National Urban Renewal Mission (JNNURM), is confident that the project would not be affected by cost overruns. In fact, even on the limited routes now in operation, the AJL claims to have met the project cost in less than three years, after the first 12.5-km stretch was commissioned in October 2009. Surveys conducted by the AJL from time to time show that nearly 23 per cent of the two-wheeler owners, more than 25 per cent of the regular autorickshaw users and about three per cent of the car owners have shifted to BRTS. People claim to be saving nearly 70 per cent in time and 50 per cent in travel cost by taking the BRTS. Having already received a number of awards, including the ‘Best Intelligent Transport System’ Award of the Centre for three consecutive years, the Ahmedabad BRTS is drawing national and international attention. AMC Municipal Commissioner and AJL Chairman Guruprasad Mahapatra says experts from various Asian and African countries, including Malaysia, Indonesia and Tanzania, visited Ahmedabad to study the system so as to replicate it in their cities. The reason is that the CEPT, which received the Central government’s award of ‘Institution of Excellence,’ mainly for its BRTS planning, learnt from the mistakes committed by Delhi and Pune in implementing dedicated bus corridors. Thus, Ahmedabad has hassle-free travel: middle-of-the-corridor bus stations; smart cards for ticketing to avoid congestion; flyovers at important junctions; and mixed traffic. The AJL offered free rides to commuters for three months before commissioning the service to get suggestions, most of which it implemented. It will still be several years before the BRTS, viewed as the backbone of the public transport system, is fully operational. In a hot city like Ahmedabad, where people are used to personal vehicles to commute, walking is not the favourite pastime. Parking points on all BRTS routes, where the commuters can park their personal vehicles, are needed along with adequate autorickshaw or municipal transport feeder services. Traffic congestion at mixed traffic junctions is another drawback, while the tickets need to be cheaper for those now using municipal buses: at present, fares are attractive to car and two-wheeler owners. AHMEDABAD: For the first time a new standard for operations for BRTS has been introduced by the Institute for Transportation and Development Policy (ITDP). From the next year onwards, the city's BRTS will be rated against 70 other similar mass transit networks across the globe, said ITDP officials. The ITDP has released the BRT Standard, Version 1.0 - a new scoring system based on internationally recognized best practice in bus rapid transit (BRT) system design. The BRT Standard awards points for characteristics such as off-board fare collection, frequency of service, level boarding, safe and comfortable station design, passenger comfort and access and good integration with cycling and walking. It deducts points for low speeds, overcrowding, poor maintenance of buses or stations, lack of right-of-way enforcement and too long or too short distances between stations. Similar to the Leadership in Energy and Environmental Design (LEED) green building ratings, the BRT Standard designates gold, silver, and bronze rankings. "While over 70 cities have created some form of BRT, many people are simply not aware of their true potential, since there is a tremendous variation in the quality of those systems," says Walter Hook, Chief Executive Officer of ITDP. "It became clear to us that a standard was needed to recognize the leaders in BRT, and to help those planning new systems," he added. Ahmedabad's Janmarg BRT system is one among the global BRT systems that soon will be evaluated by the BRT Standard Committee. "Enacting a universal standard for BRT systems will make a huge difference to world-class systems such as Ahmedabad Janmarg Ltd (AJL) by giving an official recognition celebrating AJL's achievements. If AJL earns a gold, silver, or bronze ranking, it will identify Ahmedabad as a world leader in BRT," says Hook.